The South Australian Brewing Company, makers of West End beers, were the first sponsors of the game and decided that the "Showdown" would be an appropriate name as a promotional opportunity for games between these two clubs, since it was the first time two South Australian teams had played against each other in the AFL. The rivalry between Adelaide and Port Adelaide is often considered the best in the Australian Football League with Malcolm Blight, Australian Football Hall of Fame Legend, stating in 2009 that "there is no doubt it is the greatest rivalry in football." Australian rules football has been played by designated clubs in South Australia since 1860 along with recorded instances of Gaelic football as early as 1843. In 1876 South Australian clubs agreed to universally adopt the rules of the 'Old Adelaide club' which were the closest to those in use in Victoria at the time. In 1877 eight local clubs came together, of which only Port Adelaide and South Adelaide remain, and formed the first Australian rules football administration by establishing the South Australian Football Association (later renamed as the SANFL). During the late 1970s and early 1980s the Victorian Football League began to assert its economic dominance. This assertion came in the form of expanding into other states, initially with the Sydney Swans in New South Wales in 1982, and through recruitment of significant numbers of players from other states. The Showdown's intense rivalry can be traced back to the initial attempts of SANFL clubs trying to enter the expanding VFL and the latter competition for licences for the subsequent AFL. In 1982 the SANFL approached the VFL in regards to entering two sides, Port Adelaide and longtime major rival Norwood, in the Victorian league. This action was also taken by WAFL club East Perth in 1980. All approaches were ignored by the VFL at the time with the reason given by Jack Hamilton being that the VFL clubs thought that one or two SANFL teams would end up being too strong later admitting that they also wanted to continue to poach the states best players, which would soon include Craig Bradley and Stephen Kernahan in 1986. 1982 also saw the first instance of the VFL expanding beyond Melbourne and Geelong with the South Melbourne Football Club being relocated to Sydney. The Port Adelaide Football Club's annual report from late 1982 showed that the failure of the attempts made by South Australian and West Australian clubs to enter the VFL significantly impacted the club's understanding of its future. From this point Port Adelaide restructured the club in regards to economics, public relations and on-field performance for an attempt to enter the league in 1990. There was genuine feeling that failure to do this would result in the club ceasing to exist in the future. In 1985 Port Adelaide registered itself as a national football club. Sentiment at this time amongst the direction of Australian rules football in South Australia was succinctly encapsulated by a Michael Robinson article in the 1985 Football Times Yearbook that previewed the SANFL's upcoming season. In that article Robinson wrote about the disappointment of the equal gate sharing of match takings enforced by the SANFL for the upcoming season with the stronger South Australian clubs propping up ailing clubs such as Woodville. The following year the SANFL registered the name "Adelaide Football Club" in 1986 but ended up deciding against entering a team into the VFL. In 1986 Norwood Football Club made an independent approach to the VFL with entry into the league discussed in great detail but these discussions ultimately failed to materialise. In 1987 the West Coast Eagles and Brisbane Bears were admitted to the Victorian Football League leaving South Australia as the only mainland state without representation in the VFL. By 1989 seven out of ten SANFL clubs were recording losses and the combined income of the SANFL and WAFL had dropped to 40% of that of the VFL. The 1989 Port Adelaide annual report and November newsletter contrasted with the outlook of other SANFL and WAFL clubs. After its demolition of North Adelaide in the 1989 SANFL Grand Final holding its opposition to a single goal, the club claimed a profit in the annual report and hinted at its intentions the following year in the club newsletter by saying Port Adelaide was "far better than their nearest rival in the SANFL". During early 1990 the SANFL had decided to wait three years before making any further decision. Frustrated with lack of progress, Port Adelaide were having secret negotiations in the town of Quorn for entry in 1991. A practice match organised by Port Adelaide and Geelong on the 25 February at Football Park attracted at over 30,000 spectators and illustrated the potential of a South Australian side in the newly renamed national competition. Around the same time AFL was also seeking Norwood to join the national competition in 1990. However Norwood would eventually side with the SANFL after seeing the media reaction to Port Adelaide's attempts. — Ross Oakley in regards to the other SANFL clubs opposing Port Adelaide's entry. — Glenelg coach and inaugural Adelaide coach Graham Cornes's address to the Port Adelaide change-rooms post the 1990 SANFL Grand Final. The front runners for the coaching job at the newly created club were both involved in the last SANFL game played in South Australia before the advent of a local AFL team, the 1990 SANFL Grand Final. In that game Port Adelaide, coached by John Cahill defeated Glenelg, coached by Graham Cornes, by 15 points. Graham Cornes ended up being selected to coach the Adelaide Crows for the 1991 AFL season. Cornes compiled a club list of the best players from South Australia, with few originating from other states, in what was almost a state side in the first year. Chris McDermott, captain of Glenelg in the 1990 SANFL Grand Final, was designated as the Crows inaugural captain. Despite Port Adelaide being SANFL premiers in 1990, only 5 players from the team became part of the Adelaide Crows squad of 52. Those players being Bruce Abernethy, Simon Tregenza, David Brown, Darren Smith and Scott Hodges, with the last three joining Port Adelaide's inaugural AFL squad in 1997. The Adelaide Crows admission to the AFL had a devastating impact on the leagues attendances with the SANFL recording a 45% drop between 1990 and 1993. Port Adelaide defied this trend of falling SANFL attendances recording an increase of 13% from 1990 to 1993. In 1994 the AFL announced that South Australia would receive a licence for a second team based in the state. The major bids competing with Port Adelaide this time around were from merger club proposals in Norwood-Sturt, and Glenelg-South. On 15 June the SANFL handed down a report recommending the second license go to a team formed from the amalgamation of two clubs. On 2 October Port Adelaide won the 1994 SANFL Grand Final, its fifth in seven years. On 13 December Port Adelaide won the tender for the second SA license over its various state rivals, however it was prevented from entering the competition before 1996 as stipulated in the Adelaide Crows license agreement. In 1995 after an SANFL game at Football Park the Adelaide Crows began carrying out a training session which was interrupted by a large hoard of Port Adelaide supporters chanting "We're coming to get you". Adelaide Crows coach Robert Shaw was the only Adelaide Crows official to confront the hoard. In 1996 Port Adelaide was left to wait again as a vacancy was required in the league. When the Brisbane Bears and Fitzroy Lions merged at the end of the 1996 AFL season, a vacancy had been created, and Port Adelaide were confirmed as participants in the 1997 AFL season. Along with the circumstances of the two clubs entries into the national competition are numerous other factors that fuel the rivalry. Due to the inherent nature of being the only two South Australian clubs in the competition, when a player seeks to move to the state both clubs often vigorously compete for the players signature. This also applies during the AFL Draft when both clubs will jostle for position to gain local talent. Whilst housing numerous television and radio stations with their own local personalities, South Australia simultaneous lacks the presence of either a Rugby League or Rugby Union franchise. This results in the media's sporting focus being monopolised by Australian rules football. As a result media personalities almost exclusively align themselves to one of the two local AFL teams. As a result of this intense media focus on Australian rules football in the Adelaide media by supporters exclusively from the two local clubs, the air time of interstate clubs and their happenings are reduced. Additionally it is almost impossible for executive editors and directors of media in Adelaide to not have some sort of club allegiance. An example is Andy Kay, the general manager of Channel 7 Adelaide since 2017, who is an avid Adelaide Crows fan and was the inaugural host of a program called "The Crows Show". Some presenters in radio and television are either ambassadors of the two clubs for which the individuals, in exchange for positive publicity of their club, receive invitations to club events. Additionally some media personalities and editors are simultaneously employees of one of the clubs themselves. This has led countless conflicts of interest with some using their positions in the media to discredit or slander the rival clubs. In the lead up to Port Adelaide's 2018 match against St Kilda at Adelaide Oval, Adelaide Crows member and local tabloid journalist, Mike Smithson on radio and news reports suggested that Port Adelaide fans take their poncho's and preferably stay at home due to the weather. However the Australian Bureau of Meteorology in the lead up said there was a 0% chance of rain for the duration of the match. Also in 2018 it was alleged that the Adelaide Crows had approached the Adelaide Advertiser to seek the dismissal of long time chief football writer Michelangelo Rucci who grew up as a Port Adelaide fan. Port Adelaide fans pointed to articles from 2011 and 2012 when Rucci regularly pilloried their club as proof that he is sufficiently impartial, especially considering the strong presence of pro-Adelaide Crows voices in South Australian media. When companies look to sponsor one of the Adelaide teams it has often been the case that where Adelaide media outlets are aligned with the rival club, they will attack that company. Off field the rivalry has been characterised by a litigious streak partly stemming from the SANFL's hierarchy in the late 1980's and early 1990's being predominantly made up of a small circle of Adelaide lawyers. The injunction to prevent Port Adelaide finalising talks with the AFL to join in 1990 being the most famous example. Additionally 1990 was also litigiously characterised by SANFL lawyers suing Port Adelaide administrators and volunteers, requiring the AFL to step in to seek guarantees of protection. A more recent example featuring Scott Hodges, a player for both clubs at different stages but primarily Port Adelaide, released his book describing an encounter with his teammate Andrew Jarman during his time at the Adelaide Crows, the latter player publicly threatened the former with legal action. In 2005 for the AFL's Heritage Round, the Adelaide Crows decided to wear the 1930 South Australian state guernsey. During the same match Port Adelaide were blocked by the AFL from wearing the club's Prison Bar guernsey. In February 2014, the Adelaide Crows announced that they would wear the South Australian state guernsey in the first Showdown at Adelaide Oval. This left Port Adelaide fans particularly aggrieved as many of their greats had worn the South Australia guernsey in the past. Port Adelaide released a statement at the time saying that the state guernsey was "a symbol of South Australian football unification, not division". Others commented that it would be misappropriation to use a State guernsey for a club based competition with players who came from interstate being forced to wear a symbol of South Australia. — Stephen Kernahan comments on the South Australian state guernsey. Many supporters of traditionally strong South Australian clubs other than Port Adelaide, such as Norwood, Sturt, Glenelg and North Adelaide, were left frustrated that Port Adelaide were the only SANFL club to make the transition to the AFL. — David Washington, InDaily, 2014. Adelaide and Port Adelaide fans, and administrators, especially in the 1990s, differed on what they considered the preferable model for South Australian football going forward. The SANFL, and thus the early Adelaide administrators, saw the Crows as being the top of a South Australian football pyramid. The intention being that both players and administrators would work their way up through the SANFL ranks to eventually become involved with the Crows. Alternatively, Port Adelaide fans and administrators believed that the strongest SANFL clubs, especially itself and rival Norwood as per an earlier joint bid in 1982, were the equal, at least historically, of VFL clubs. Thus from this perspective the ideal model for South Australian football going forward would be to gain entry itself alongside other strong South Australian clubs into an eventual national competition, with reserves playing in the SANFL. To this day there are supporters of both clubs who believe the other club should not be in the Australian Football League. The Showdown has a history of upsets with ladder ranking and betting markets being a poor indicator of the final result. As of Showdown 44, over a third of meetings have gone the way of the lower ranked team. In addition to this the overall head-to-head lead has been held by both teams at different stages, has never gone beyond a differential of 6 and, as of Showdown 44, is equal with both teams on 22 wins each. This contrasts with the Western Derby where West Coast have never relinquished the lead of the head-to-head ledger and have at some stages held a 12 win differential over Fremantle and the Sydney Derby where the Sydney Swans have also never relinquished the lead of the head-to-head ledger and held an 8 win differential over the GWS Giants after 9 meetings. In the inaugural Showdown, Port Adelaide beat the Adelaide Crows by 11 points. Having won their first match in the AFL against Geelong the week before, a pumped up Port jumped the Crows in the first half and managed to hold on in the final quarter as the Crows mounted a comeback. The game notably also featured a fight between Port's Scott Cummings and Adelaide's Rod Jameson. Dennis Cometti, commentator for the inaugural Showdown, later elaborated on his chameleon comment saying that when the Adelaide Crows entered the AFL some Port Adelaide supporters began to follow the new team as it was the only South Australian club competing on the national stage, but six years after their original club attempted to do the same, they reverted to supporting Port Adelaide after they won the first showdown. The round 5, 2002 Showdown was the second time in a row Port Adelaide had won by 8 points. After the game players from both sides coincidentally came across each other at the Ramsgate Hotel in Henley Beach. During the match Josh Carr had been tagging Mark Ricciuto holding him to only 6 kicks (for comparison Ricciuto averaged 13 over his career). After the game when the groups of players met at the Ramsgate Hotel the two started an argument, and with the assistance of alcohol, a brawl between the two groups broke out. No one was badly injured. The publicity of this incident resulted in the only consecutive Showdown crowds of 50,000 at Football Park. Showdown XV is memorable for the magnitude of the upset that the Adelaide Crows pulled off and the fact that it ended Port Adelaide's 7 game winning streak in Showdowns. At the start of the game Port Adelaide had won 5 of its first 6 games whilst Adelaide had only managed one. The gambling markets had Adelaide at $5 to win the match, the longest odds offered in any Showdown. Port Adelaide entered the first break with a 6-point lead but the Adelaide Crows coach of the time Gary Ayres gave his side a spray and subsequently ran away with the game to cause arguably the biggest upset in Showdown history. In the 2005 AFL Finals Series, Adelaide and Port Adelaide met in a semi-final, the first time, and thus far only time in their history they had played against each other in a finals game. The stakes of a showdown had never been higher and South Australia experienced an unprecedented high anticipation to the game in the week leading up to the match. The match was known in the buildup as "The Ultimate Showdown". The first half of the game was an intense, defensive contest with the Crows leading 4.7 (31) to 3.6 (24) at the main break. Tempers almost boiled over in the second quarter after Adelaide ruckman Rhett Biglands was stretchered from the ground after a Byron Pickett shirtfront. However Biglands would return in the second half and the incident would eventually be deemed legal. After half time, Adelaide thrashed Port Adelaide outscoring them by 76 points cruising home for an 83-point win, ending Port Adelaide's season. This remains as the only final played between the two sides and the only final the two would ever play at Football Park. 2005 was also the only time one of the clubs had defeated the other side in 3 Showdowns in the same AFL season. Showdown 24 is often cited as the most physical meeting of the two clubs. Early in the match Dean Brogan fractured Luke Jericho’s sternum. The game was memorable in the Adelaide Crows ability to just hold and limp to the siren for a win despite having four injured players on the bench against a Port Adelaide side with all the momentum kicking the last three goals of the match, with Daniel Motlop bringing the margin to 6 points with two minutes remaining. The 6 point margin was at the time the smallest in Showdown history and the result evened the ledger for the first time since 2000. In 2013 Port Adelaide beat Adelaide in the final Showdown to be played at Football Park. The game was also memorable for Port Adelaide's late final quarter charge, coming back from 20 points in the last 6 minutes of the game. This included a goal by Angus Monfries from outside 50 that landed just in front of the Port Adelaide's point line, bounced at right angles and went through for a goal. Chad Wingard kicked his fifth goal in the last 28 seconds to hand Port Adelaide the lead and win. Port Adelaide winning this match meant the club had won the first, last and most Showdowns played at Football Park. “ Monfries has kicked a goal, unbelievable! That makes up for Robbie Gray in the first quarter...It's gone at right angles, right angles Tim! I haven't seen anything like that, if Pythagoras is watching, explain that! The round 2, 2014 Showdown on 29 March 2014 saw the first Showdown played at Adelaide Oval along with the first game of Australian rules football at the venue since its extensive redevelopment. Port Adelaide led from the start, with Matthew Lobbe kicking the first goal in an Adelaide Oval Showdown but Adelaide mounted a comeback and claimed the lead briefly in the third. After the halfway mark of the third quarter, Port Adelaide ran away with the game winning by 55 points. The round 16, 2015 Showdown on 19 July 2015 had added significance due to the recent death of Crows senior coach Phil Walsh, who spent ten years as an assistant in two stints with Port Adelaide, including their 2004 premiership. The game lived up to expectation, with the Crows holding on desperately in the last quarter to win by three points, the closest margin in a Showdown. The game was played in front of 53,518, the largest attendance at the venue since the 1973 SANFL Grand Final. Scott Thompson was awarded the one off Phillip Walsh Medal, presented by Walsh's daughter Quinn. The round 8, 2018 Showdown held on 12 May 2018 is heralded as one of, if not, the greatest showdown of all time. the match was played at Adelaide Oval in front of a Port Adelaide home-crowd of 50,967. The game may not be remembered for its relatively dull first half which saw the Adelaide Crows race out to 21-point lead moments before half-time. However, it will be remembered for its high octane second-half which saw Port Adelaide cut Adelaide's margin back to single figures with 5 minutes left in the third quarter. Robbie Gray kicked 2 goals late (his fourth and fifth of the quarter) to give Port Adelaide the lead at three-quarter time. The final quarter was largely played in Adelaide's forward half but they could not trouble the scoreboard. With less than three minutes to go, the game looked all-but over with the Power almost certain of a win. But it wasn't over yet. Adelaide managed three goals in little over 2 minutes to regain the lead with 42 seconds on the clock through a Mitch McGovern set shot. One last turn would see off-season Port Adelaide recruit Steven Motlop kick the winning goal with 21 seconds left, sending the Power fans into a frenzy. Robbie Gray claimed the showdown medal for his best on ground display. He managed 6 goals (5 of which in the third quarter). The win ended Adelaide's 5-game winning streak over Port Adelaide. Showdown 45 was a tight contest for the entire game apart from the opening where the Crows kicked the first three goals of the match. Second gamer Kane Farrell kicked three goals to close out the first interval with the quarter time scores level and the margin thereafter never again reaching three goals. Late in the final quarter Ollie Wines had the opportunity to seal the game with a set shot from a tight angle but his banana kick was ineffective. Minutes after Wines shot, Josh Jenkins snapped and his score was referred to the goal review umpire to clarify whether it hit the post. The score was quickly ruled a goal by the goal review umpire despite Josh Jenkins calling his teammates to set up for a kick out. He later stated his doubt in a post game interview. 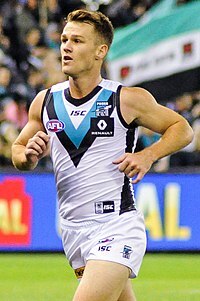 Robbie Gray was awarded a record fourth Showdown Medal becoming just the third player, after Graham Johncock and Shaun Burgoyne, to win the honour coming from the losing side. The two clubs sometimes meet in preseason fixtures, however these are not official Showdowns and do not contribute to the official statistics of the fixture. While the AFL draw is not a complete double round robin it is designed each year to include two Showdowns in recognition of its significance and gate drawing power. The Showdown Medal is awarded to the player adjudged best on ground in the Showdown match. The Showdown Medal was first presented in Showdown VII (round 7, 2000). For Showdown XXXIX only, The Phil Walsh Medal was presented in place of the Showdown Medal. Phil Walsh was a Port Adelaide assistant coach from 1999 to 2008 and 2014 and was Adelaide's head coach in 2015 before he died on 3 July the same year. NOTE: No medal was awarded in Showdown XIX. As the Showdown medal was only introduced in 2000, six Showdowns were played without a medal being awarded. Those players who were deemed by the umpires in the Brownlow Medal voting to be best on ground are listed below. Michelangelo Rucci, the chief football writer for The Advertiser, has suggested that these players be retroactively awarded Showdown Medals. Below is a list of players who have played a senior game of football representing both the Adelaide Football Club and Port Adelaide Football Club. Two players, Matthew Bode and Brett Chalmers, have appeared in Showdowns for both clubs. *Years underlined indicate periods where players were on Adelaide's AFL list but played for Port Adelaide between 1991–1996 when the club's senior team was still in the SANFL. Below is a list of AFL sanctioned trades between the two clubs. Only three trades have ever been orchestrated between the two clubs. The Showdown has the highest average attendances of all intrastate derby matches. In the 45 Showdowns to 2018, a total of 2,017,918 people have attended the matches: an average attendance per match of 44,893. The record attendance in a Showdown was 53,698 in Showdown XLII (round 3, 2017, a Port Adelaide home match). The lowest attendance was 31,662 in Showdown XXV (round 16, 2008, a Port Adelaide home match). A total of 1,053,674 people have attended Adelaide's 23 home Showdowns (including the 2005 Semi Final), an average of 45,812. Their attendances have ranged from 40,296 (Showdown IX) to 51,140 (Showdown XIII). A total of 964,244 people have attended Port Adelaide's 22 home Showdowns, an average of 43,829. Their attendances range from 31,662 (Showdown XXV) to 53,698 (Showdown XLII). Due to the ever-strong demand for tickets to the Showdown, the AFL have traditionally fixtured the game in undesirable time slots with the knowledge that a good crowd will show up regardless. The Showdown has never been scheduled by the AFL on a Friday night, universally held to be the premier time-slot for fixtures. Highest score in a Showdown. Lowest score for each club in all Showdowns. Greatest winning margin for each club in the Showdown. Smallest winning margin for each club in the Showdown. Years where one club has won all Showdown fixtures. Last update from Showdown 44. Last update from Showdown 45. Last update from Showdown 43. Showdown players ranked by win percentage (minimum 10 Showdowns played). Showdown coaches ranked by total wins followed by win percentage. ^ "Why we win the derby Showdown". Retrieved 15 April 2017. ^ "FOOTBALL". South Australian Register. XXIV, (4225). South Australia. 30 April 1860. p. 2. Retrieved 15 April 2017 – via National Library of Australia. ^ "THE COMING FOOTBALL SEASON". South Australian Register. XLII, (9485). South Australia. 9 April 1877. p. 7. Retrieved 15 April 2017 – via National Library of Australia. ^ a b c d Abernethy, Bruce (1997). From Port to a Power. Kent Town, Adelaide: Wakefield Press. p. 71. ISBN 186254400X. ^ "Fight On East Perth - Applying to Join VFL". www.amnet.net.au. Retrieved 8 October 2015. ^ a b Oakley, Ross (2014). The Phoenix Rises. Richmond, Victoria: Slattery Media Group. p. 156. ISBN 9780987420596. ^ a b "Port Adelaide Football Club..."one must ask does the 'Big V' want the game to go national"". Australian Football. ^ a b c Robinson, Michael (1985). "Yet another season of advancing backwards". 1985 Football Times Yearbook (1976–1992). Ashley Hornsey. pp. 10–12. ^ a b c "Revisiting the South Australian license saga of 1991". The Roar. ^ Whimpress, T.J. (1989). Port Adelaide Football Club Inc. Report of the Football and Footballers Clubs. Largs Bay, South Australia: Largs Bay Printers. p. 26. ^ Weber, Bruce (1989). Magpie News. Largs Bay Printers: Port Adelaide Football Club. p. 3. ^ "AFL sought Norwood". The Canberra Times. 64, (20, 209). Australian Capital Territory, Australia. 10 August 1990. p. 13. Retrieved 1 August 2017 – via National Library of Australia. ^ "Port Adelaide from SANFL to AFL". ABC: Stateline South Australia. ^ Fishburn, Chris (April 1990). "Keeping Score '90". Magpie News. p. 34. ^ "Put Port Adelaide into AFL: Oakley". The Canberra Times. 64, (20, 205). Australian Capital Territory, Australia. 6 August 1990. p. 22. Retrieved 10 May 2018 – via National Library of Australia. ^ Graham Cornes, 1990 SANFL Grand Final, Channel 9. ^ a b c "On this day: Inaugural squad named – AFC.com.au". afc.com.au. Retrieved 15 April 2017. ^ "Past players – portadelaidefc.com.au". portadelaidefc.com.au. Retrieved 15 April 2017. ^ The Budget. Adelaide: SANFL. 1994. ^ "Port Adelaide AFL Bid Video". Port Adelaide Football Club. 1994. ^ Tony Greenberg, Inside Football, 8 June 1994. ^ Jeff Reynolds, Australian Football, May 2016. ^ Rucci, Michaelangelo (14 December 1994). "Premiers SA's Second Team". The Advertiser (Adelaide). pp. 1–2. ^ a b Rucci, Michelangelo (29 May 1996). "What makes Port Adelaide different from the Crows?". The Advertiser (Adelaide). ^ "Michelangelo Rucci Says He Was "Threatened" By The Crows After Injury Article". FIVEaa. Retrieved 26 April 2018. ^ "Statement: State Guernsey - portadelaidefc.com.au". portadelaidefc.com.au. Retrieved 26 April 2018. ^ Fjeldstad, Jesper (7 February 2017). "Showdown 1 recall". Herald Sun. ^ Kernahan, Stephen (7 February 2017). "SANFL forces Adelaide Crows to abandon 'State of Origin' Adelaide Oval Showdown guernsey". The Advertiser. ^ "Dear Port fans: you just don't get it - InDaily". InDaily. 6 February 2014. Retrieved 24 October 2018. ^ "Footy Park Flashbacks #3: Showdown I, Port Adelaide v Adelaide Crows 1997 – portadelaidefc.com.au". portadelaidefc.com.au. Archived from the original on 24 September 2015. Retrieved 1 November 2015. ^ a b Cometti, Dennis (6 April 2017). "Showdown 1 recall". Port Adelaide Football Club. ^ "AFL Tables – Adelaide v Port Adelaide – Sat, 27-Apr-2002 7:10 PM (7:40 PM) – Match Stats". afltables.com. Retrieved 23 December 2016. ^ "'Henley beach' two attracts the footbrawl faithful – realfooty.com.au". www.theage.com.au. Retrieved 1 November 2016. ^ Rucci, Michaelangelo (17 July 2015). "delaide Crows face biggest Showdown challenge since 2004". The Advertiser. Retrieved 13 May 2018. ^ "The Finals Showdown - AFC.com.au". afc.com.au. Retrieved 13 May 2018. ^ "Pickett off the hook for Biglands bump". ABC News. 12 September 2005. Retrieved 3 August 2018. ^ "Phil Walsh - a proud 'football lifer' - AFC.com.au". afc.com.au. Retrieved 13 May 2018. ^ Homfray, Reece (19 July 2015). "Terrific Scott Thompson 'honoured' by Phillip Walsh Medal win in Showdown 39". The Advertiser. Retrieved 13 May 2018. ^ a b c "Live AFL Round 8, Port Adelaide v Adelaide Crows in Showdown 44, live scores, live stream, updates, video, live blog". Fox Sports. 12 May 2018. Retrieved 19 June 2018. ^ "List of Showdown Medal Winners (1997–2013)". Herald Sun. ^ Mark Ricciuto and Shane Mensforth, Roo (Sydney: Pan Macmillan, 2007), 105. ^ "Best and fairest player to be awarded Phil Walsh Medal at upcoming Showdown". abc.net.au. 16 July 2015. Retrieved 16 July 2015. ^ "Subscribe to The Advertiser". www.adelaidenow.com.au. Retrieved 9 April 2017. ^ Rucci, Michelangelo (6 September 2016). "The decade of silence between Crows and Power at trade talks could be finally broken by Hamish Hartlett". heraldsun.com.au. ^ "AFL Tables - Showdown". afltables.com. Retrieved 3 August 2018. Nathan "Bassy" Bassett is a former Australian rules footballer for the Adelaide Football Club in the Australian Football League (AFL). He is currently an assistant coach with the Port Adelaide Football Club. Scott Thompson is a former Australian rules footballer who played for the Melbourne Football Club and Adelaide Football Club in the Australian Football League (AFL). He was drafted by Melbourne with pick 16 in the 2000 national draft from Port Adelaide in the SANFL, and was traded to Adelaide after the 2004 season. He is currently an assistant coach at the Port Adelaide Football Club. The 1990 SANFL Grand Final was an Australian rules football game contested between the Port Adelaide Football Club and the Glenelg Football Club, held at Football Park on Sunday 7 October 1990. It was the 89th annual Grand Final of the South Australian National Football League, staged to determine the premiers of the 1990 SANFL season. Paul Seedsman is a professional Australian rules footballer playing for the Adelaide Football Club in the Australian Football League (AFL). He was recruited by Collingwood in the 2010 national draft, with pick 76, and traded to Adelaide at the end of the 2015 season. Seedsman grew up supporting Collingwood; his great-grandfather, Jim Sharp, played for Fitzroy and Collingwood, and was president of Collingwood for 12 years. Chad Jordan Wingard is a professional Australian rules footballer currently playing for the Hawthorn Football Club in the Australian Football League (AFL). He was drafted to Port Adelaide with the sixth selection in the 2011 AFL Draft from the Sturt Football Club in the South Australian Football League (SANFL). The Adelaide Football Club, nicknamed The Crows, is an Australian rules football club which competes in the South Australian National Football League (SANFL). Originally established in 1990 for the national AFL competition, Adelaide was permitted entrance in the SANFL competition as a reserves team beneath the AFL team from 2014. Rory Atkins is a professional Australian rules football player who plays for the Adelaide Football Club in the Australian Football League (AFL).